As many of you may already know, King Henry VIII is my favorite monarch of the Tudor dynasty. If it wasn’t for his reign I do not believe the Tudors would be as popular as they are today. With the creation of Showtime’s THE TUDORS, many of us were aware of the name Henry VIII but really didn’t know much about him. In the show we were able to see that there was more to the man than the execution of two of his six wives. While I understand that THE TUDORS tv program had a bunch of historical inaccuracies, it also got people (like myself) to look deeper into the history by reading and absorbing as much as we possibly could. Over a decade later I feel like I have a fairly good grasp on the infamous king and would like to share my understanding of him with you all. Henry VIII was a man, well…maybe a man-child, but he wasn’t just the tyrannical ruler that many see him as today. There was much more to him than most understand. I hope with this series on his life that you will look at Henry in through new eyes. As stated previously, many of you may already know that Henry VIII is my favorite of the Tudor monarchs. My opinion isn’t always in the majority and I’m okay with that. Henry ruled England from 1509 until his death on the 28th of January 1547 and has helped to make the Tudors as popular as they are today. As the second son of King Henry VII, young Henry was not expected to become King of England and so he was sent to Eltham Palace to be raised with his sisters. While at Eltham, Henry would have most likely had constant contact with his mother, Elizabeth of York. When you consider Henry’s relationship with women in his life one must wonder if he was constantly on the search for a woman like his own mother. Elizabeth of York had a great influence on her son and may have helped educate her children during her lifetime. Born at Greenwich Palace on the 28th of June 1491, Henry Tudor was the third child and second son of King Henry VII and Elizabeth of York. His parents marriage had put an end to decades of fighting between the Yorks and Lancasters in what we know as the Wars of the Roses. For the most part, Henry’s childhood would have been idyllic, but not without occasional bits of drama. The fact that Henry’s father claimed the throne on the battlefield against Richard III did not sit well with supporters of the Lancasters…and for that matter the Yorks were not pleased either. In 1487, a young man named Lambert Simnel was coerced to play the part of Edward Plantagenet, Earl of Warwick to raise arms against the new Tudor king, Henry VII. At the same time, the real Edward Plantagenet was sitting in the Tower of London. It did not take long before Simnel was discovered as a pretender. At some point around 1494, Perkin Warbeck came on the scene. The reason I say 1494 is because in 1494, young Prince Henry was given (by his father) the title of Lieutenant of Ireland. This would not be the last time that Henry VII gave a title to his second son in an attempt to show control. In July 1495, Warbeck took fourteen ships, funded by his supposed aunt, Margaret of York, along with 6000 men across the channel to England in hope that he could claim the throne of England. Things didn’t quite turn out the way he had planned and he and his men fled to Ireland. Before long they had moved to Scotland where Warbeck gained the assistance of King James IV of Scotland. Warbeck was claiming to be one of the lost princes in the Tower, the younger of the two brothers, Richard, Duke of York. Many believed he was truly the young prince and that the throne of England should be his by right. Henry VII would not have another pretender using a title that was meant for his son, and in 1494, three-year old Prince Henry was titled as Duke of York. There could not be two and Henry, at the moment, was the true title holder, not Warbeck. At a young age Henry would have known that a monarch’s throne is never 100% secure. It also must have been a bit confusing for him and his sisters to understand that some of their mother’s family wanted to remove their father. Everything changed in April 1502 when Henry’s older brother, Arthur, died unexpectedly at Ludlow Castle. Henry went from a mostly carefree childhood to a life that led to him being overly protected as sole heir to the throne of England. Gone were the days when he could run “freely” and have unrestricted fun – to feeling like a prisoner of his father’s. Henry had been betrothed to Katherine Aragon in 1503, he was twelve years old. As stated previously, Henry’s life, once Prince of Wales, was thoroughly controlled by his father, the King. The betrothal to the dowager princess of Wales was something that would evolve with the ever-changing politics of the day. While his brother Arthur had been, practically from birth, trained in the ways of kingship, Henry’s training did not begin until he was eleven years old. The young Prince of Wales was not used to the rigorous training he received to prepare him for the throne and he only had seven-year to cram for the biggest role of his life. At Richmond Palace, on the 21st of April 1509, King Henry VII died. He was fifty-two years old. His son, who was only eighteen years old was now King of England. When he came to the throne, Henry VIII was described as exceptionally tall, well-proportioned, had the features of a Greek god and moved gracefully. His complexion was fair, had auburn hair and a rounded face with the features so delicately formed that they ‘would become a pretty woman’. This new, young king naturally commanded attention and authority by appearance alone. Henry had always been fascinated by Katherine. She was beautiful and he was enchanted by her. After the death of his father, Henry decided that he would marry Katherine of Aragon. And he would claim it was his father’s wish, on his deathbed. The couple was married six weeks after Henry accession at the chapel of the Franciscan Observants at Greenwich. Henry would also be quoted as writing to her father, Ferdinand of Aragon that, “If I were still free, I would still choose her for wife before all other”. They would have a double coronation, or crowning, thirteen days later, on Midsummer Day, 24th of June 1509. It was the coronation that set the tone for Henry’s reign – it was the beginning of the Renaissance period in England. It had also been a long time since a King came to throne with such approval and adoration. It was a new era – one of education, music, jousting and overall fun. The court was full of young people, which was the opposite of the reign of his father. Henry was eager to open his father’s coffers (which were overflowing) to celebrate his new role. If you could see how everyone here rejoices in having so great a prince, how his life is all their desire, you would not contain yourself for sheer joy. Extortion is put down, liberality scatters riches with a bountiful hand, yet our King does not set his heart on gold or jewels, but on virtue, glory and immortality. The other day he told me ‘I wish I were more learned’. ‘But learning is not what we expect of a King’, I answered, ‘merely that he should encourage scholars’. ‘Most certainly’, he rejoined, ‘as without them we should scarcely live at all’. Now what more splendid remark could a prince make? William Roper, the son-in-law of Thomas More also remembered how the young King was eager to learn. He recalled how More and the King would discuss astronomy, geometry, divinity and other worldly affairs all hours of the night. Henry truly enjoyed conversing with More and enjoyed learning from him and having discussions with him as well. Henry VIII wasn’t always the tyrannical monarch who would execute you if you looked at him wrong – at the beginning of his reign he relented to public outcry against his father’s tax collector, Richard Empson and Edmund Dudley. While the public wanted to see the men put away Henry was eager to spend the fruits of their labor. The mood at Tudor court had changed drastically since the changing of the guard – now there was laughter in the corridors at court and continuous festivals to enjoy. Under the new administration both high-born and low-born men had the same opportunities. 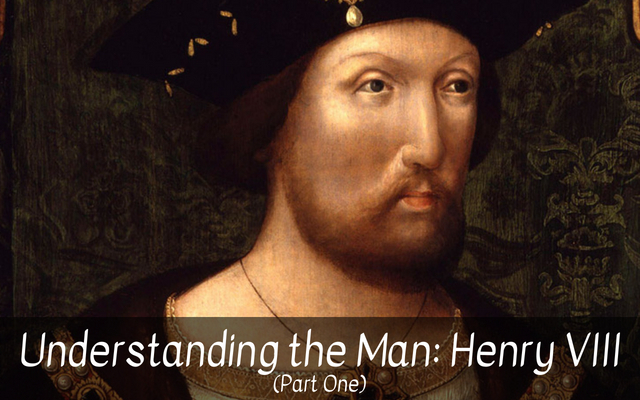 While Henry understood the importance of having men of noble birth and experience in key positions he also appreciated men of ambition, like Thomas Wolsey – a man who would soon become pseudo king. That’s where we’ll end Part One of this series on Henry VIII – next we will continue you on with the story of the life of Henry VIII and understanding him a bit better in Part Two. I rather think he inherited the looks and build from Edward IV, who also put on weight and lost his appeal. Edward only lived to be about forty, though. Imagine if he’d lived longer – he would have been as gross as his grandson. If Henry had been heir to the throne from birth, he probably wouldn’t have had all that scholarly background; younger aristocratic sons were destined for the Church.